The Hay Festival of Literature & Arts is an annual literature festival held in Hay-on-Wye, Powys, Wales, for ten days from May to June. 2019 dates - May 23rd - June 2nd ! Presteigne, (Llanandras in Welsh), was once the county town of Radnorshire and nestles at the heart of the Marches on the border of Wales and England. Surrounded by devastatingly beautiful, unspoilt countryside, this thriving border town has many unique qualities that make it both a perfect destination and a base from which to explore. Set alongside the river Lugg, at the corner of the three counties of Shropshire, Herefordshire and Powys, it is within a short drive from Hay on Wye, Hereford, Ludlow and Shrewsbury. Presteigne has been voted one of the top 10 towns in Britain by Country Life magazine. The reason for this award is obvious, as the town boasts an array of black and white timbered buildings, narrow streets, individual shops, tea rooms and traditional pubs as well as the award-winning Judges’ Lodgings, a Victorian museum complete with stunning judges’ apartments, servants’ quarters, courtroom and cells. The town plays hosts to music and arts festivals throughout the year as well as a monthly farmers market. Just over an hour and a half from Birmingham and the beautiful coastline of West Wales, it would be difficult to find a better place to stay for easy access to the rich variety of experiences necessary for a rewarding break. There’s always something on hand, or within easy reach, to treat the whole family. A short drive away you will find the small town of Kington, well regarded as a centre for walking, it is celebrated by visitors for its lovely scenery and excellent walking and cycling in the surrounding rolling hills. This quiet, pleasant town also offers a number of excellent shops, pubs and restaurants. There is a variety of tourist attractions close by including the Kington Small Breed Farm Park and Owl Centre, the pretty blooms at the Hergest Croft Gardens and Radnor Hill, which boasts England’s highest golf course. There is plenty to do and see or you could just unwind, relax and enjoy the cottage together with the local atmosphere of our pretty town. Horse riding is available nearby, Guided walks, Bowling Green. There is also a well-equipped sports centre located in Presteigne, including a swimming pool, should you be feeling energetic. For details on local events please visit presteigne.org.uk or visit the local tourist information office which is situated at the Judges Lodgings, Broad Street, Presteigne. 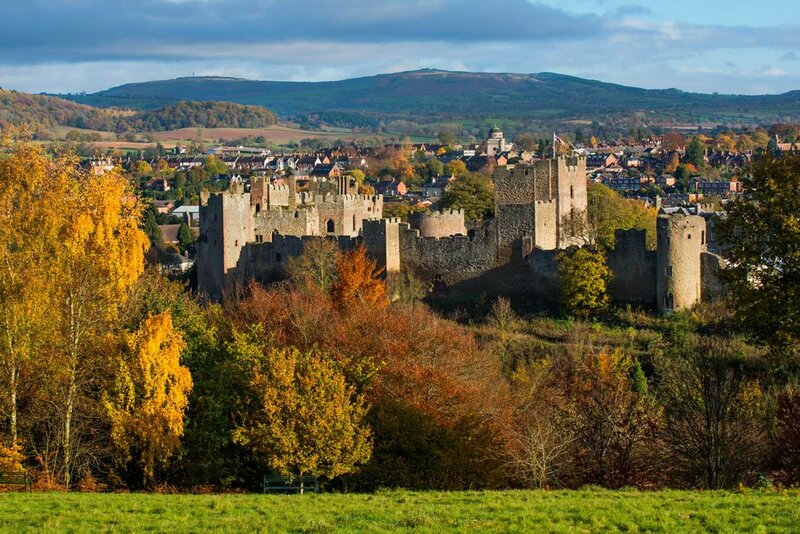 Pay a visit to Ludlow that boasts a magnificent castle, over 500 listed buildings and stunning medieval street pattern, provides a fascinating backdrop for the town’s regular street markets, showcasing a range of goods - from cheeses and fresh produce to books and local crafts. Take a day trip to the town of books, Hay-on-Wye, or the pretty market town of Leominster or Hereford with its cathedral home to the Mappi Mundi world map. Oak View Cottage is a hidden gem in the heart of Presteigne, Powys, Wales.